What can I say. 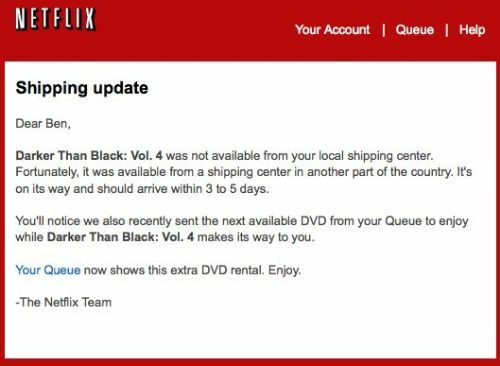 Netflix continues to wow me with their automated customer service. Now, granted, this could be because I’ve been with them since … well, forever. In any case, it never ceases to amaze me that they just send me extra movies, or gifts (in the form of refunds) because of something that they mishandled or just think that it’s taking too long for the turn-around. In fact, I think this is the first time that their customer service has sent me an extra DVD due to the fact that it would take a bit for it to get here. Don’t ask me why, but it makes me happy to support a company that actually thinks about the fact that I’m not made of money, and there are little things you can do that can make a person happy with your service. This is one of them. Definitely will have to take a page from their customer service book and apply it in my own accounting software business.